This app lets you quickly take a snapshot of the scene that you are working on - essentially a quick, personal backup. You can also browse your history and restore old snapshots. We're working on the documentation as we speak & it will be coming soon. We'll make sure it's worth the wait! If you have access to the Shotgun Pipeline Toolkit, you also have access to the source code for all apps, engines and frameworks in Github where we store and manage them. Feel free to evolve these items; use them as a base for further independent development, make changes (and submit pull requests back to us!) or simply tinker with them to see how they have been built and how the toolkit works. You can access this code repository at https://github.com/shotgunsoftware/tk-multi-snapshot. Description: Specify a hook to pre-generate a thumbnail for the snapshot. Description: A reference to a template which defines the location where snapshot backups will be stored on disk. Description: Specify a hook that will be used to copy the file 'source_path' to 'target_path'. Description: All the application specific scene operations (open, save etc) that the app needs to carry out are collected in this hook. This stops further libpng errors mentioned in v0.7.2 release notes from occurring. Adds context switching for Nuke Studio support. Now prompts yes,no,cancel asking if a snapshot should be taken prior to restore. Merges Hiero scene operations into the Nuke hook. Changes necessary to allow the tk-nuke engine to run within the Hiero mode of Nuke 9.0+. Details: Fix for PyQt compatibility. Added Photoshop Support. Improved Softimage Support. Added Hiero and Houdini Support. Another fix to make snapshot more robust when template contains the user but the work template does not. 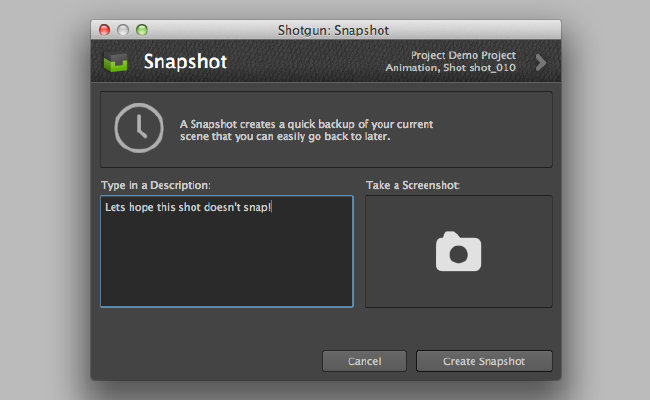 Fixed issue stopping snapshot from working when snapshot template contains the user but the work template doesn't. Various UI tweaks & fixes. Added 'snapshot' interface to app for use by tk-nuke-quickdailies. First release to the Tank Store. Anyone else thinks that the Restore feature is annoying? There's a lot of cases where you don't want to save a snapshot of the current scene before restoring. Worst case is if you have, say, 5 snapshots of the current scene, and wants to open them one by one to find something you did in the past, then you'll end up with 10 snapshots because the app won't let you restore a snapshot without creating a new one. We keep this dialog, but it instead it asks you if want to snapshot the current scene, with Yes/No/Cancel as the options. There's a per-user "sticky" checkbox pref in the Snapshot History UI that lets you specify if the current scene should be snapshot when one is restored, so the user wouldn't get a pop-up dialog each time. There's a setting in the environment configuration for the app that lets this behavior be set for the environment (i.e. always snapshot, always don't snapshot). 1 feels the strongest to me, and the pop-up is ok since it doubles as the "Are you sure you want to do this restore?" but it would be great to hear your take on this! I think too that option #1 is best as it keeps the existing behavior. I'm curious though how you would implement the per-user sticky behavior of option #2? Is there such mechanism in place in Toolkit? Some of the apps make use of this "sticky" feature already, like the File Manager/Set Work Area app(s), which will remember if the user has checked the "Show Only My Tasks" box across Maya sessions. The new Loader will also likely make use of this for remembering certain filters, and in general, we feel like this can be a nice usability improvement when it makes sense. Mmm stumbled on this page to see if I could find exactly how I could disable this behavior for now - till something like option 1 is implemented. Could I just comment out something somewhere to disable that portion of the restore action? Hey there oliver! To disable the app you need to go into your configuration, find the env folder and then comment out/remove all tk-multi-snapshot app declarations. It can be a bit technical, let us know if you get stuck! Sorry I think I was not quite clear. I meant disable the creation of a snapshot on the restore of a snapshot. We use snapshot's exclusively for saves to ensure our publish and work versions stay in sync - so that part is great. Looking through previous files via the snapshot tool however spams us with many duplicate versions of our existing snapshots. Very quickly artists leave the pipeline tools and start digging through the physical snapshot files to circumvent this. I did have a look in the config/env folder and poked through a few .yml's and couldn't find the said app-declarations. However I am not at a computer with any ability like "find in files" at the moment. Will check again when I get the chance. We had the same issue. What we ended up doing is forking the app and doing the change in the code. This is the only change we have in our forked version, so if Shotgun wants to integrate such a change, we could create a pull request for this, so then we can use the official version again. Hi Benoit, we'd love to take a look at that change... sounds like a good one. Could you submit the pull request and we'll take a look? I just did the pull request for this app. The change is quite small. You might want to re-phrase the message. Hi Benoit! Looking sweet! I just released 0.5.2 with this functionality added. Thanks for the help! that way it is intuitive and new users to shotgun have same functionality. I agree with Adam. Having used a shortcut for "increment and save" in Maya for years, it would really help me take to advantage of this "snapshot" functionality if there was also a shortcut for it. Is this not already available? To me it doesn't feel as time efficient to save regularly if I have to go through menus and a dialogue just to save an incremental version, and instead I am opting to continue to use the standard Maya "increment and save" feature because it does have a shortcut. Having the option to swap out the "increment and save" shortcut for this behavior seems like an intuitive suggestion.